Some of the most magical diamonds are often purchased from major auction houses like Sotheby’s and Christie’s. However, there are a number of fancy color diamond dealers where these unique pieces can sometimes be sourced. Still, even from these companies it isn’t every day that the rarest colors pass through their inventory. So what are the rarest colored diamonds? Of the various different colors, Fancy Red Diamonds are by far the rarest. They are not often found, and sourced from very few locations around the world. The Moussaieff Red: a 5.11 carat, Fancy RED diamond with an IF clarity grade. This magnificent stone is known as the largest internally flawless red diamond in the world. The Hancock Red Diamond: A 0.95-carat, Fancy Purplish Red, Round Brilliant Diamond. Although it is slightly less than a carat, this stone remains one of the most famous red diamonds of all time due to its color. You have heard the 4 C’s Cut, Clarity, Carat, and Color, but there is something more important. It’s the amount of bling, shine, presentation… It’s “the thing” that is the most important, yet the least discussed. You have to see it to know it. The Brightness, Pattern, and Fire are the Brilliance Factors. How attractive is it? How does it show? 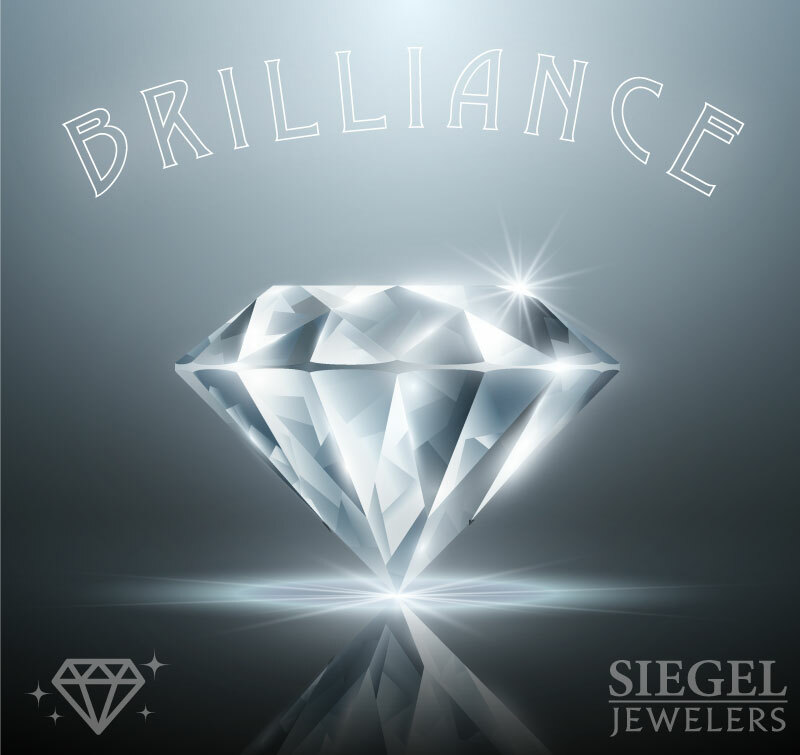 You want your diamond to be bright, radiating, and lively. Only by going to your local jeweler and seeing your diamond in person can you really get a sense of what it looks like. No website, photo, or video can give you the sense of what your diamond is really like. How can you know your diamond’s personality if you haven’t met it in person! But, there are a few more important details. The way your diamond is set, the way that it is displayed, and what it has around it will make a big difference to how it performs when you are out and about. Having a diamond that has good C’s is nice, but it is only one small step in how it will shine for the next hundred years. Work with a knowledgable jeweler who will help you put together the right diamond and complementary setting that will wow from across the room . When on a diet, you might not keep to the diet 100%, but every salad you have is a step in the right direction. The same is with Ethically Sourced Gold and Gems! Your whole store might not be 'green' but why not one showcase? I think the problem is that the mining and sourcing problems seem so big, thatjewelers are too paralyzed to do ANYTHING. You don't need to save the planet, but EACH responsible gem you buy is a step closer to a healthier world. Won't it be cool to use these hashtags in your media? You can. All the Pictures of people above are Real Gem and Gold suppliers doing the right thing. It's not hard, just connect with one of them. Baby step #3 is pick one responsible source, like the dealers on the left, and connect. Don't You Want this in your Store Window? you can tell customers you "SUPPORT Responsibly Sourced Gold and Gems"
You say your customers don't care about the earth or were gems come from. Well then at least you should have a hand out ready for those who DO. This is one Signet (Kays & Zales) gives out showing THEY support responsibly sourced gold and gems. *Don't you want to feel good about what you sell? *Do you care what you put on your body? That is because most of the white stones we get in the market today come from Southern Africa - Angola, Botswana, Sierra Leone - and those mines didn't exist then. The older, yellow looking old cuts Stones were coming from Brazil and Venezuela. or two color grades whiter. Because of their open culet, color is not trapped in the stone. Old mine cuts were a product of the technology of the time. The diamonds, cut without the advantage of motorized machinery, followed the rough diamond's octahedral shape. In the 1900s, with the advent of motorized machinery, more evenly cut diamonds arose. It bridged the roundish old mine cut and the modern round of today. The main the difference between the cuts can be seen on the back facets. On the old European, they radiate out from a large culet pretty much evenly, like a pie would be, whereas the old miner has rays and then kite facets coming off the culet. Andrew from Cincinnati says this great line. "when a diamond is sent to GIA it is given grades based on the opinion of three men, none of who's opinions matter right now. You know who's opinion matters? HERS. All that matter is what she see's when she opens that box"
'Did that guy cheat on his daughter?'" an error many of us selling jewelry make is the assumption a customer can't afford something, or it would be irresponsible of them to buy it. If your staff can't imagine themselves owning the items they sell, then it will be hard for them to sell those expensive items to customers. The reason you are not selling more big items is because in the back of your mind you think you can't, or you would not spend $10,000 on a bracelet so you don't see how others can. Think of the time you bought that really nice belt, or toaster. It seemed like a lot of money at the time, but think how much use and enjoyment you have gotten out of it! In the long run quality saves you money. My first big sale was to a 21 year old girl in dirty overalls who bought $8000 earrings. I know everyone here has stories like this. Even your friends might have an inheritance you don't know about. Always show the BIG diamonds 1st. You can always go smaller after that, but if you don't show the big jewelry you won't sell the big jewelry. An apprentice once asked a wise old master goldsmith, "What is the best shortcut you know"? They grey haired old master craftsman thought for a while, considering the hundreds of techniques and thousands of tricks he had learned. He thought and he thought, and then his eyes lit up as he settled in on the ultimate way to save time at work. Slowly he responded: "The fastest way to do anything is to do it right the first time." Jewelery work requires great patience, in addition ...to an unyielding commitment to precision. Think of precision and patience as partners, helping you to stay focused on achieving your goal of excellence, no matter how long it takes. Building jewelery should not be a race against time, but a journey towards quality. In the long run, your work will be judged not by how fast you completed it, but by how WELL you completed it. This requires a dedication to doing your best at every step, so that you don't waste time reworking or undoing needless mistakes. #2 IT IS NOT A WARRANTY ! "This certificate is NOT an appraisal, guarantee, or warranty." Ask your customer "If all a cert is, is just the opinion of one gemologist, on one particular day, why should it be so important?" open to interpretation. However I will personally spend time with you showing you the actual diamond so you can be the most informed buyer." This Holiday we are making shopping easy. A diamond bar necklace for only $100 works for ladies young and old. also very stack able. In Italy, bank customers can do something that many in North America would find strange — buy diamonds. As Reuters explains, diamond brokers work through several banks throughout the country. The deals generated sales of more than $320 million last year. A couple comes in together (let's call them Mike and Stephanie). Mike is ready to spend about $20k, which is a LOT of money for a young couple, and I'm showing them rings in that range, but Stephanie keeps pushing for more, and more, and MORE. Finally, with enough begging, pleading, smiles, and thinly veiled sexual promises, she talks him into a 3 carat center diamond, with an elaborate setting, for around $30k. Honestly, I don't feel great about having to witness this whole exchange, but at the end of the day, it's none of my business, so I complete the transaction. About 3 weeks later, Stephanie comes to my office alone. I assume she needs the ring re-sized or something, but instead she asks me if I can remove the center diamond and replace it with a CZ (cubic zirconia, a very cheap diamond substitute). I'm surprised, so I stammer "sure, but why? Are you traveling or something and don't want to risk the stone?" She responds that it's nothing like that, she just prefers to have the CZ in there for now. Obviously, every red flag in existence is waving in front of my eyes at this point, so I say OK, take her ring, and tell her she can come back in a day or two to pick it up with the CZ in it. But as soon as she's out the door, I'm dialing Mike. After all, HE'S the one who wrote me a $30k check, so HE'S my customer, not HER. Mike picks up, and after a moment of small talk, I ask him if he knows what Stephanie is up to. "NO!" is the shocked response. Mike called me back the next day and told me that apparently Stephanie was planning to call off the engagement and return the ring, but keep the 3 carat diamond. He was obviously very upset, and asked me if I could give him a refund. I offered my sympathy, and gave him back his money. Needless to say, he was very grateful that I had called him. About 2 years later, Mike came back with another woman who I liked much better. They're happily married with two kids now. Mike and I have become friends, and he's probably referred me 10+ other customers over the years. As for Stephanie, after she left my office that day, I never saw her again. Why do I get so little money when I sell back my ruby? My friend Ankur tells me that the market is flooded with TREATED GEM stones. These are gem stones that have been altered to look better. This has causes the price of most colored gems to drop dramatically. It costs more money to sort them, than to cut new gems. Ever bought something at full price, only to find it went on sale the next day? You felt like a sucker right? You will be giving your customer the same felling if you sell them lab-made diamonds. What's a Jeweler to Do? I get it. I'm cheap. But there are lots of options on how you can source and sell a diamond for less. Too many people think diamonds are controversial or some how bad. We need to stand up for natural diamonds. Instead of running to get a lab-diamond who's price will drop before you even ring up the sale, try to convince them of the merits of natural diamonds. When giving a gift, how many times have you heard, "Wow! How did you know it's what I really wanted?" Not often, if you're like most people. That's because the art of gift giving draws on two elusive qualities -- being a good listener and knowing what she loves. Listening means shutting off your, "can't-wait-to-get-back-to-the-game" voice and giving her your full attention guys! Also, knowing what she loves may take some stealth investigation! Follow her on Pinterest or Instagram to get a sense of her style or to view that special bling she "likes." Shopping for your wife/girlfriend should be exciting! Find someone who can ask the right questions to refine your choice of a gift according to her tastes. A great salesperson (or one of her trustworthy friends) can help you create the perfect gift. Keep it reasonable. Taking out a sec ond mortgage to buy a shiny adornment may not make her happy. But, creating a magic moment and setting it in stone will be a gift that keeps on giving. You don't see the inside of a shirt. Your Friends don't see the inside of the shirt. you know its nice, but you are paying money for something that is never seen! And has little effect on beauty. the color of the diamond is the WHOLE STONE. clarity is just a small portion. With a diamond, many guys put money into clarity, when the WOMAN would much rather enjoy a higher color or size.